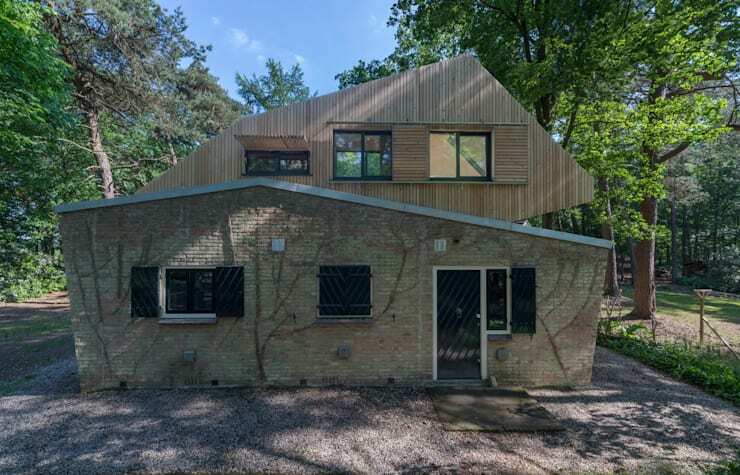 This little stone house in the forest was in need of a modern extension, and architects Bloot made it a smash hit. The new and simple wooden second floor has an amazing skylight, to give a view of the surrounding natural beauty and the starry skies at night. Let's take a look at this simple, natural home. We love the combination of old stone and fresh wooden panels. There's no better materials for making a home feel harmonious with its natural surroundings. It's also a nice touch that the extension peaks on the right, balancing out the original home's roof that peaked on the left. Balanced achieved. 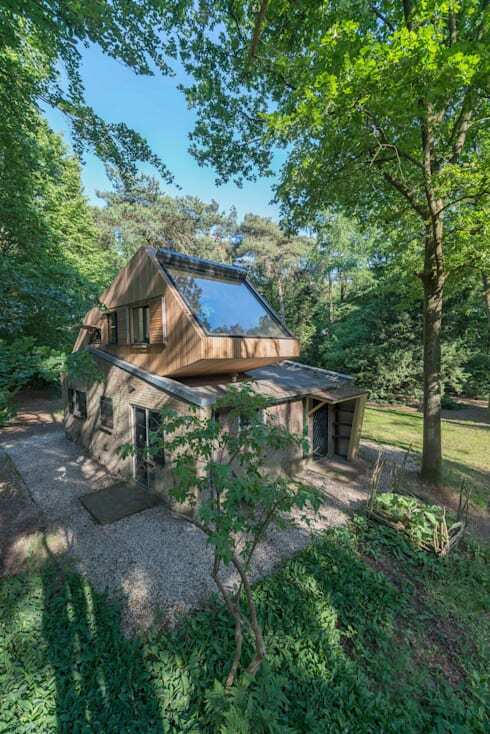 From this side angle we can see the home's massive skylight, angled so that it can take in views of the tree tops during the day or the stars during the night. We can also see just how green the home's yard is, what a relaxing location! Inside the extension, the walls have been covered with simple wooden boarding, left plain. 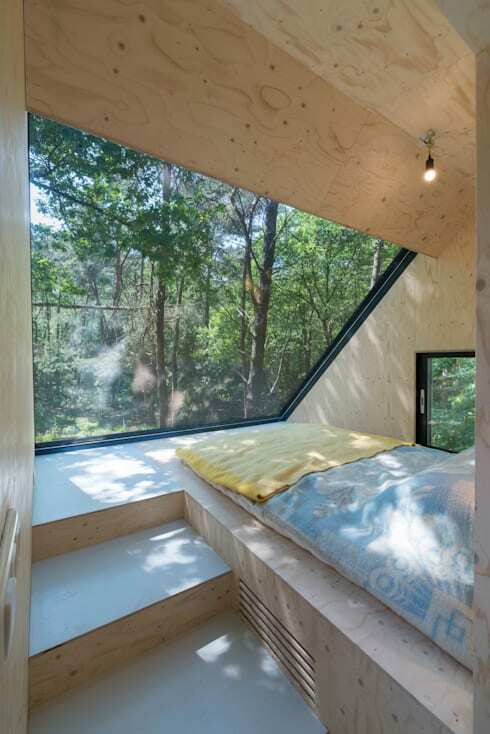 This ensures that the visual emphasis of the room remains on the gorgeous natural scene provided by the skylight. 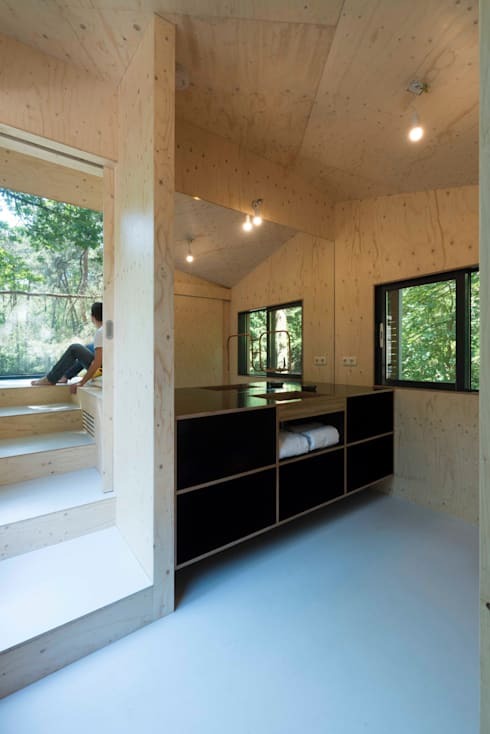 The walls also feel smooth and natural, mirroring the forest environment outside. If you've noticed the little light above the bed you've seen exactly how dedicated the architects are to the view-- that small light isn't ditracting at all. You don't want to sacrifice bold style in every space of a home, of course! The old main floor of the existing home has been given a modern style upgrade, with white walls paired with dark stained wood. The simple staircase that has been installed to allow for access into the extension of the home is stylish as well. It feels industrial with the steel beam supports, but elegant in all-white. 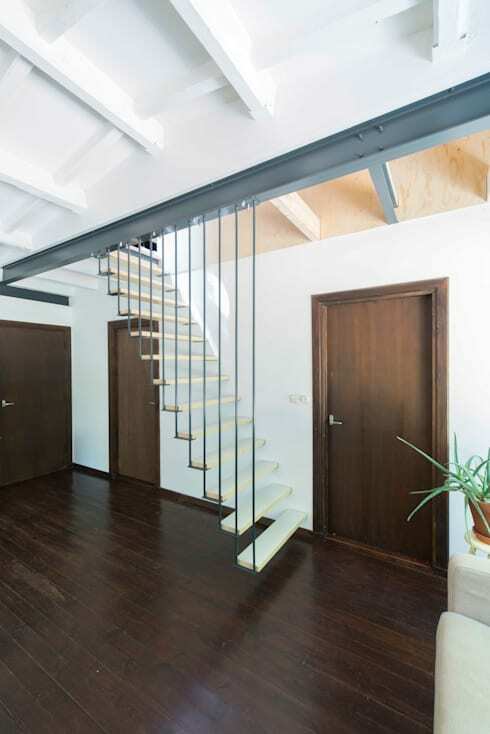 The unusual supports that are anchored above the stairs instead of below give the owners as much floor space on their main floor as possible. For a dramatic staircase like this you'll want to contact a professional for sure. Back upstairs, we can see that there's more to the extension than just the bedroom. This splendid bathroom has a few tricks up its sleeve, including a big unadorned mirror that makes the room feel huge. The black cabinet is a dramatic contrast to the plain wood that adds a feeling of polish to the space, while providing a ton of storage. 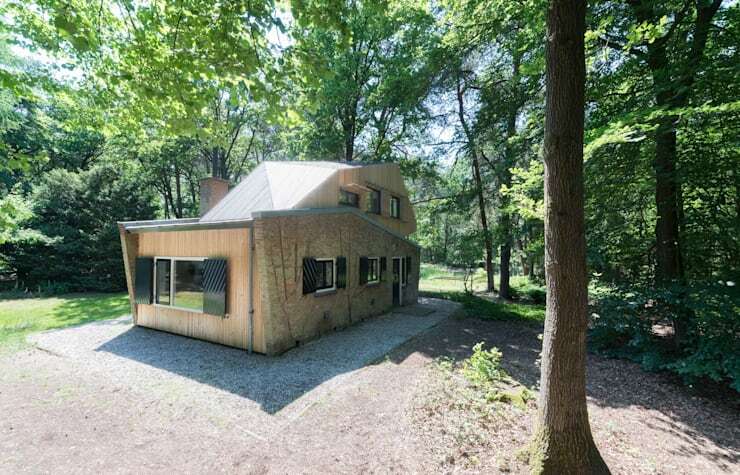 If you're looking for more home inspiration that takes its style from nature you'll love this forest home full of charm. If you're in the city but want to add some natural elements to your home these 7 rustic doorways will inspire you. Would you be pleased with this home extension? Let us know in the comments!